The April Xara X tutorial is a joint project using Xara X1 and the new Xara 3D-6 (more info below) to create a wall clock. 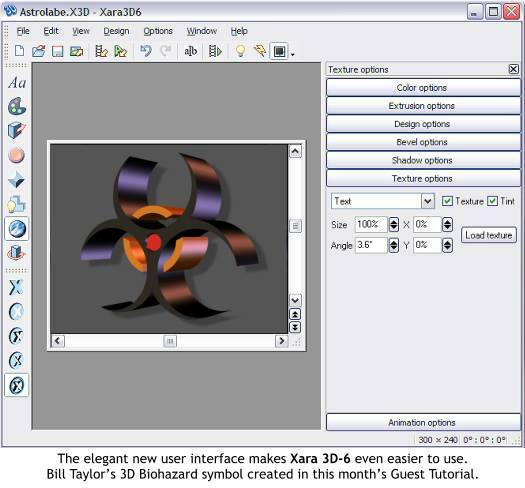 The April Guest Tutorial, by Bill Taylor (aka Soquili) is another joint Xara X1 and Xara 3D-6 project and creates a 3D biohazard symbol. The April Featured Artist Gallery features Rian Moseley (aka inabottle) with some really terrific images. If you would like to be considered for one of the group shows, e-mail me and let me know where I can see a few of your images. I am accepting your contributions (Tips, Brushes, Templates, stuff like that). I'm starting to run out of ideas and could use your input. If your site has Xara graphics and is not listed, send me your link and a brief description of how you have used Xara on your site. Xara 3D-6 — Same Great Program with Many Great New Features! Traditional 3D programs are notoriously difficult to use and understand. Not so Xara3D 6. Unlike much modern 'bloatware' that offers more features than are ever likely to be used, and take an age to learn and understand, Xara3D has been created to perform one job, and performs that job with style, speed, and slick simplicity. Xara3D 6 is solely designed to create the highest quality 3D text and graphics, such as logos, titles, headings and buttons. It's the perfect way to add impact to your web pages, mailshots and presentations (all images are fully anti-aliased for that smooth, professional quality). Xara3D can also create awesome 3D animations in seconds - GIFs, AVIs and simple Flash movie sequences - and you can even enhance your desktop by saving any animation as a screen saver! The previous advertising copy is from the Xara 3D-6 web page. And while I cannot argue with any of it, what Xara left out is how much fun Xara 3D-6 is and how even the least artistic person can create something way cool just by keying in some text and then applying any of the dozens of predesigned animation templates. As those persons who are 1/3 my age would say, it rocks! And the big news is now you can create and copy a shape in Xara X1 and paste it directly into Xara 3D-6! In this month's Xara Xone Guest Tutorial, Bill Taylor shows you how he created this biohazard symbol (a request from Daz, one of the Xara X Conference members) in Xara 3D-6. Once you get the idea of how to do it, the possibilities are endless for what other cool things you can create using this technique that Mike Sims came up with and which Bill Taylor builds upon in his tutorial. Click here for more information, and to download your free trial version of Xara 3D-6. Trust me on this one, you got to have it!!! without the express written permission of the author.